Public prayer in Jesus' name: yes or no? 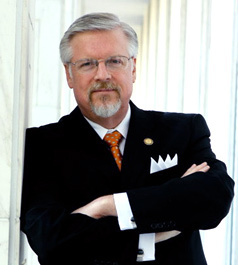 Since the 4th Circuit Court of Appeals ruled in Joyner v. Forsyth County that prayers offered in Jesus' name are unconstitutional and the U.S. Supreme Court refused to hear an appeal, some 25 to 30 government bodies across North Carolina have been in the cross hairs of groups like the American Civil Liberties Union and the American Humanist Association. They demand that any sectarian prayers cease and desist. The ruling essentially turned the First Amendment on its head. Judge Paul Niemeyer, in his dissenting opinion, rightly lamented that in the ruling the court "dared to step in and regulate the language of prayer — the sacred dialogue between humankind and God." This precipitates my sharing about two resources I recently came across that address this topic. In September my son (Matt) and his wife (Kimberly) visited the U.S.S. North Carolina. This great battleship, also known as "Showboat" took part in every major naval offensive in the Pacific during World War II. It became the most highly decorated American battleship, accumulating 15 battle stars and is now a museum ship and memorial docked in Wilmington. While browsing the ship's gift shop, Matt and Kimberly came across an old "Song and Service Book for Ship and Field," used by Chaplains for both the Army and the Navy. According to the gift shop, the book had only recently been discovered in storage and was on the ship when the "greatest generation" fought to end tyranny around the world. Knowing my love for rare and out of print religious books, they purchased it as a gift for me on my birthday. I must say I was elated to receive this newfound resource and immediately started to thumb through its pages. What I found on a cover page astonished me — something to my chagrin I had never seen before — something I would every American could read — Washington's Prayer for the Nation. 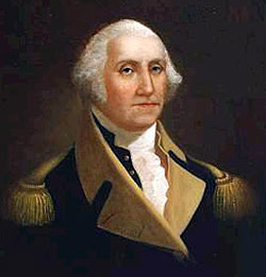 Almighty God, we make our earnest prayer that Thou wilt keep the United States in thy holy protection, that Thou wilt incline the hearts of the citizens to cultivate a spirit of subordination and obedience to government, and entertain a brotherly affection and love for one another and for their fellow citizens of the United States at large. And finally that Thou wilt most graciously be pleased to dispose us all to do justice, to love mercy, and to demean ourselves with that charity, humility, and pacific temper of mind which were the characteristics of the Divine Author of our Blessed religion, and with an humble imitation of whose example in these things, we can never hope to be a happy nation. How incredible! Washington writes a prayer and sends it to all the nation's governors. The prayer as it reads in the service book and other places was altered from Washington's letter and does not actually include the ending "through Jesus Christ our Lord." Nevertheless, the bulk of the words are Washington's and those sentences that include the father of our great nation referring to Jesus Christ as the "Divine Author" of our nation's "blessed religion" remain. It would be more than an error and nothing less than an egregious revision of history to suggest the prayer's reference is not to Christ, some religion other than Christianity, or even a generic spiritual expression. The prayer is unquestionably sectarian in nature. Can you imagine if Washington were living and prayed such a prayer in a public venue today? The coming headlines would be something like, "ACLU Says Washington's Prayer Unconstitutional," or "The American Humanist Association Threatens to Sue Founding Father," maybe even, "ACLU Argues 'Father of the Nation' Misguided on Constitution." Let me further note that Washington's altered prayer as it's recorded in the service book for the Army and Navy in 1941, ending that prayer in the name of Christ, is unquestionably sectarian. Yet no legal efforts were being threatened at that time to deem it as a violation of the separation of church and state. God help us! How we've been led astray! How badly we've fallen! Since discovering Washington's Prayer for the Nation in an unexpected place, I also came across another great find. My wife (Kim) and I love to stop at Antique stores whenever I'm traveling for speaking engagements. Recently we stopped at a store in the mountains of North Carolina, where I was drawn to a bookcase filled with, yes, you guessed it, more out of print religious books. 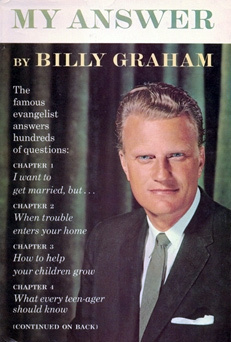 Among them was a treasure, a 1960s copy of Dr. Billy Graham's, "My Answer." The book presents several hundred of some of the most interesting questions ever put to the famous evangelist and his answers in a newspaper column carried by over 150 newspapers for several years. In a public function where there are people of different faiths, should a Christian pray or not pray in the name of Christ? Wow! What a succinct and powerful answer concerning the Christian's privilege and duty in prayer. You know, I have never prayed publicly that the prayer wasn't offered in the name of Christ. But I have determined more than ever, God showing me grace, I will never do so. Moreover, I will not rest until my God-given, unalienable constitutional right to publicly pray according to the dictates of my own conscience is freely restored, not only for me, but for all people everywhere who cherish religious liberty. I hope you will join me, as well as many other Christians, no matter the time it may take or whatever the cost. Ivan L. Bennett, Chaplain, U.S. Army, Chairman of the Editorial Committee, Song and Service Book for Ship and Field, Army and Navy, A. S. Barnes and Company, New York, 1941, cover page.